Fruit Belt Members Please Remember: You will no longer pay a separate fee to the Athletic Assignors Association. Your good standing status in the FBOA (paid membership) covers this expense. To pay your dues for the 2018-19 school year, choose your membership type from the drop-down list below (new member or returning member). Then click the "Pay Dues Now" button. This will take you to PayPal's site, where you can quickly complete the process. If you don't have a PayPal account, and want to use a credit card, choose the "Don't have a PayPal account?" link (see image below). This is just an example of the link to click on PayPal's site (after clicking the "Pay Dues Now" button below) if you don't have a PayPal account and just want to pay with a bank or credit card. When finished, you will return to our website. Important: If you are NOT a member of the Fruit Belt Officials Association and are attempting to pay your ArbiterSports assigning fees, you are in the wrong place. To pay ArbiterSports fees now instead of FBOA dues, CLICK HERE. ArbiterSports Technology Fees for the Athletic Assignors Association. Speakers retained to address members at meetings. Costs for members to attend trainer sessions. These are only some of the items covered by member dues. 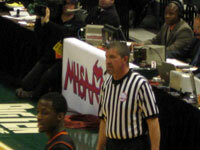 The annual amount has not changed in many years, and is a small price to pay for the opportunity to learn with, grow, and mentor others in the best officiating techniques. In addition to helping to provide the necessary tools for our organization to function, members who are current on dues have satisfied one of the criteria for being considered a "Member in Good Standing" of the Fruit Belt Officials Association. (Regular attendance is the other main criteria.) This is extremely important as regards state tournament selection by the Michigan High School Athletic Association. The MHSAA is increasingly looking to local associations for tournament recommendations. A member cannot be recommended by the FBOA if he/she is not a "Member in Good Standing," and a member cannot be a "Member in Good Standing" if his/her dues are not current. We have now made it easier to get current on your dues. Using the button above, you can pay renew your Fruit Belt Officials Association membership in only a few minutes. The transaction is handled through PayPal, a completely secure, recognized leader in online payments. Best of all, you do not need a PayPal account to use this feature, and it costs you absolutely nothing extra! You can pay using any major credit card or via PayPal if you prefer. An email receipt will be delivered to your inbox upon completion of the process. At no time during this process do we see your credit card information...it is all handled through PayPal and is completely secure.